Kirk Herbstreit (/ˈhɜːrbstriːt/; born August 19, 1969) is an American analyst for ESPN's College GameDay, a television program covering college football and a provider of color commentary on college football games on ESPN and ABC. He appeared annually as a commentator in EA Sports' NCAA Football until the series was put on hiatus following NCAA Football 14. He was a quarterback on the Ohio State football team. He saw action in several games his junior season and was the starting quarterback throughout his senior season. Herbstreit graduated from Centerville High School in Centerville, Ohio, a suburb of Dayton. As a quarterback for the Elks, he was the Ohio Gatorade Player of the Year as a senior. He also was a standout baseball player. Herbstreit was the first player to commit to the Ohio State Buckeyes after the hiring of John Cooper as head coach in 1988. Herbstreit was a four-year letter winner as a quarterback at Ohio State University from 1989 to 1993. After waiting his turn as a Buckeye starter behind Greg Frey and Kent Graham, Herbstreit finally led the team as a senior in 1992. That year he was a co-captain (along with linebacker Steve Tovar) and was voted team MVP. Herbstreit passed for 1,904 yards that season, including four 200-plus yard games, before losing to the Georgia Bulldogs in the Florida Citrus Bowl. As a college quarterback, Herbstreit had held the Ohio State record for pass completions in the rivalry game against Michigan, with 28 passes for 271 yards in a 13–13 tie in 1992, until it was broken by Troy Smith in 2006. Herbstreit's father, Jim Herbstreit, had been a co-captain (along with offensive tackle Jim Tyrer) of the 1960 Ohio State team, and was later an assistant coach at Ohio State under Woody Hayes. When Herbstreit was named co-captain in 1992, the two became only the second father-and-son duo to have each been Ohio State captains. (James and Jeff Davidson were the first in 1989; Pepper and Dionte Johnson became the third in 2007.) Herbstreit graduated from Ohio State in 1993 with a degree in Business Administration. He lives in Franklin, Tennessee, with his wife and four sons. He also is known for a 2009 case in which he sued the IRS for changing an implied policy of allowing deductions for house donations to the fire department for training purposes. Herbstreit is actively involved in multiple charities including the 2012 Buckeye Cruise for Cancer and The Make A Wish Foundation Ultimate Sports Auction. He has lent his name to the Kirk Herbstreit National Kickoff Classic in Columbus, Ohio, and Arlington, Texas. According to the website, the Kickoff Classic "pits high school teams from the states of Ohio and Texas against prep football powerhouses from across the nation" over the Labor Day weekend. The games in Ohio are usually held at Ohio Stadium, while the games in Texas are held at AT&T Stadium. 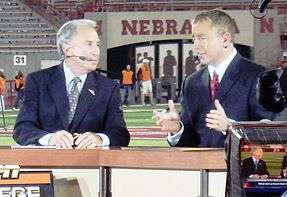 Lee Corso and Herbstreit discuss college football on an evening update of ESPN College Gameday. Rece Davis, Desmond Howard, and Lee Corso sit alongside Herbstreit on the ESPN College GameDay set, discussing the day's college football games, and analyzing highlights and players. Every Saturday, College GameDay goes to colleges all around the United States to preview the school's upcoming football game. Herbstreit serves as an analyst for ABC Sports' college football prime time series alongside either play-by-play man Brent Musburger. He was nominated for a 1997 Sports Emmy Award as television's top studio analyst, along with Cris Collinsworth (eventual winner), Howie Long, Terry Bradshaw and Steve Lyons. He is a frequent contributor to ESPN.com and ESPN The Magazine. In 1997, he wrote a weekly in-season column—"Inside The Game With Kirk Herbstreit"—for The Sporting News. Herbstreit previously worked Thursday night games for ESPN as a color commentator, and he is currently in the booth for Saturday night college football games on ABC. On the day of the 2007 SEC championship game, Herbstreit incorrectly reported on ESPN's College GameDay that Les Miles had accepted an offer to succeed Lloyd Carr as the head coach at the University of Michigan. Herbstreit is also a contributor to the Columbus, Ohio-based FM radio station 97.1 The Fan; 97.1 is also an ESPN Radio affiliate. In July 2007, he served as a panelist for the series "Who's Now" alongside Keyshawn Johnson and Michael Wilbon. It was announced on June 28, 2010 that Herbstreit would host a weekly college football radio program on 97.1 The Fan in Columbus. Herbstreit met his wife, Allison, at Ohio State where she was a cheerleader. They were married in 1998 and have four sons (including one set of twins). Herbstreit and family moved from his home in Ohio in 2011 because of harassment by vocal Ohio State fans accusing him of directly criticizing his alma mater. Herbstreit was quoted as saying "It's the vocal minority that make it rough. They probably represent 5 to 10% of the fan base but they are relentless." ↑ "About Kirk Herbstreit". Retrieved October 15, 2012. ↑ Lynn, Kathy (2009-07-23). "Herbstreit 'fire' puts focus on IRS dispute". Columbus Dispatch. Retrieved 2010-09-07. ↑ "Source: Miles will remain coach at LSU"
↑ "'Relentless’ Buckeye fans have driven Kirk Herbstreit from Ohio"
Wikimedia Commons has media related to Kirk Herbstreit.